A queen is standing on an \$n\$x\$n\$ chessboard. The chessboard's rows are numbered from \$1\$ to \$n\$, going from bottom to top; its columns are numbered from \$1\$ to \$n\$, going from left to right. Each square on the board is denoted by a tuple, \$(r,c)\$, describing the row, \$r\$, and column, \$c\$, where the square is located. 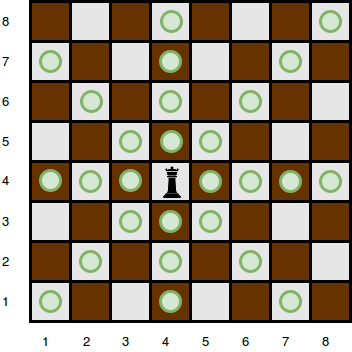 Given the queen's position and the locations of all the obstacles, find and print the number of squares the queen can attack from her position at \$(r_q,c_q)\$. The first line contains two space-separated integers describing the respective values of \$n\$ (the side length of the board) and \$k\$ (the number of obstacles). The next line contains two space-separated integers describing the respective values of \$r_q\$ and \$c_q\$, denoting the position of the queen. Each line \$i\$ of the \$k\$ subsequent lines contains two space-separated integers describing the respective values \$r_i\$ of \$c_i\$ and , denoting the position of obstacle \$i\$. A single cell may contain more than one obstacle; however, it is guaranteed that there will never be an obstacle at position \$(r_q,c_q)\$ where the queen is located. Print the number of squares that the queen can attack from position . We then print the number of squares she can attack from that position, which is \$9\$. For example, left direction \$(0, -1)\$, clockwise, next direction is left-up, \$(1,-1)\$. Enumerate all directions, for each direction, starting from the position of queen, just increment one by one using two direction arrays if staying in the boundary of matrix and it is not an obstacle cell. Currently, you read all the obstacles into an array, and then you add all your obstacles from the array to a HashSet. You could just skip creating the array and just add the obstacles directly to your HashSet instead. Another thing that would help would be to determine if the obstacles even need to be added. An obstacle only needs to be added if it lies in a direct path of the queen in one of the 8 directions. If the obstacle is not in the path of the queen, it doesn't need to be added to the HashSet. Just making the HashSet more efficient might make your program fast enough to pass the challenge. But your main loop still has to check each square in each of the 8 directions, and this takes quite a bit of time. There is a simpler way to solve the problem without using a HashSet and without using a loop over the squares. Imagine we have an array which holds the distance from the queen to the nearest obstacle in each of the 8 directions. 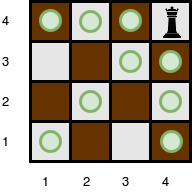 Initially, the array is initialized to the distance from the queen to the edges of the board. As we read in each obstacle's position, we can determine whether the obstacle is in the path of the queen in one of the 8 directions. If it is, and it is closer than the nearest obstacle in that direction, then we can update the array to make the new obstacle be the nearest obstacle. 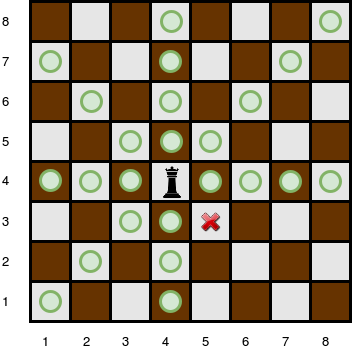 After handling every obstacle, we can find the number of squares the queen can attack by summing the values of the array, which are the distances from the queen to the nearest obstacle in each direction. There is a slight adjustment of -1 to each direction because the queen can't actually attack the obstacle itself. // Initialize distance to edge of board in each direction. // Not in any of the 8 directions, skip this obstacle. // can't move on to the square of the obstacle. Not the answer you're looking for? Browse other questions tagged c# programming-challenge time-limit-exceeded matrix chess or ask your own question.